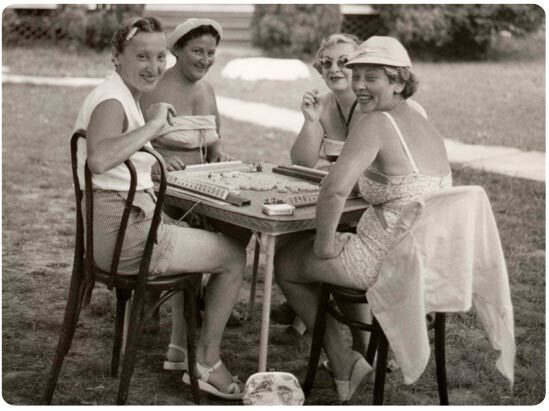 My wonderful Mother and Aunt had a rotating group of players from high school days and when it was our turn as hostess night, my sisters and brother and I fell asleep happy hearing the tile ‘slapping’ and the laughter of the ladies. Years later, when many of the original group had either passed away or moved away, the remaining were all on medication and would discuss ailments, foods they could not eat, etc. They decided to have one more game at our house, where the tradition had started 48 years before, as several were leaving the city soon for various reasons. My quiet, serious Father decided the event might become too grim so off he went to Katz’s Deli for sour pickles, pastrami sandwiches on seeded rye with mustard, cole slaw, desserts and Dr. Brown’s root beer/black cherry sodas and served them at games’ end…in black tie! Laughter erupted, pills were forgotten, husbands (including those whose wives had passed away and who my Father had invited as a further surprise) suddenly appeared and the eating and singing and joke-telling went on till early morning…no one wanted to leave…and, once again, they were young and together…ah, the magic of that game! AND you carry on the tradition with style! This entry was posted in Mah Jongg and Me and tagged cole slaw, Dr. Brown's root beer, katz's delicatessen, mah jongg, mustard, pastrami, pickles on October 1, 2014 by Mah Jongg and Me. How totally lovely. Thanks Cook! What a lovely gesture, and a great story – made me smile! Early morning with tears in my eyes… My group began over 35 years ago. We saw death, dementia, moving away…This story is the most, most wonderful vision of a perfect ending to many years of Mah Jongg love and community. Thank you. Toby – thank you for your comment. I had tears in my eyes as well when Cook sent this to me. It is a story that we all can relate to and appreciate. Very sweet story…and one we appreciate as we age and face some of these same issues. Dottie – you are absolutely correct – I really have great appreciation for stories such as this one.